Yesterday was my one year anniversary as an attorney in the State of Idaho. We don’t have any plans to celebrate, but I just thought I would make a note of the date. I wanted to include a picture I took in 2005 and the only one that I could find that really seemed to indicate my fondness for Idaho. Therefore, this photo of me and George Laird Shoup. I don’t expect anyone outside of Idaho to know who George Laird Shoup is or what his relationship is to me or Idaho. Honestly, I might be surprised if the majority of Idahoans know about him. 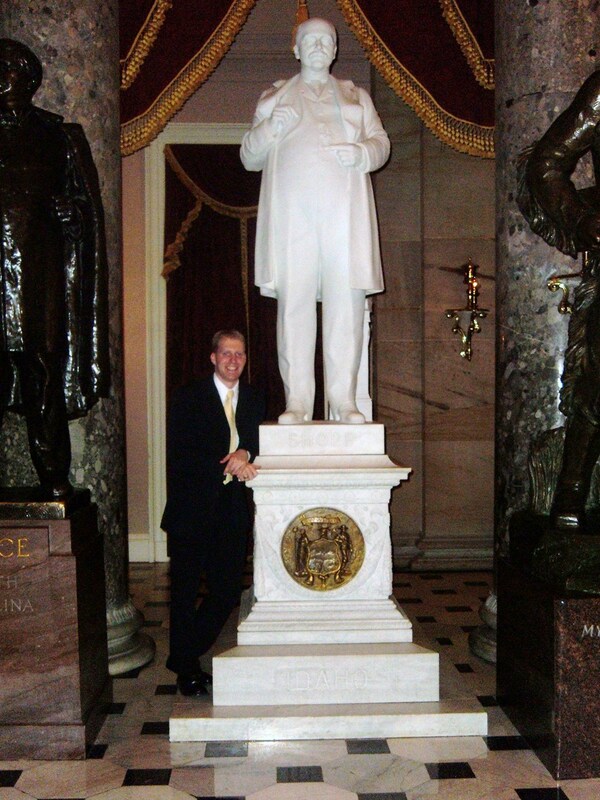 As you might be able to tell, his statue is one of Idaho’s two in the National Statuary Hall Collection located in the United States Capitol. As a side, the other statuary from Idaho is William Edgar Borah, who I could not get a photograph with due to his location in the US Capitol. This statuary was donated over a century ago. I do believe he is like many other historical figures, he was just in the right place at the right time. Shoup was appointed by President Harrison as Governor of the Idaho Territory. After Idaho became a state he was elected Idaho’s first Governor. The Idaho Legislature then elected Mr. Shoup as one of Idaho’s first United States Senators. As Governor, he only served a few weeks. He served just over 10 years as US Senator before he was defeated. Other than being the first Governor and one of the first Senators, I don’t know that he leaves any other lasting legacy on our State. But his statuary still represents us in Washington, DC.